As a member of a one-TV/Comcast household—and the only member of that household who much prefers to watch televised sporting events over, say, a formulaic crime drama or anything Kardashian-related—I’m often outvoted when it comes to deciding what to watch. But now, with Comcast’s new AnyPlay, I’ll soon be able to use the iPad as a second TV to watch Comcast’s live TV service. 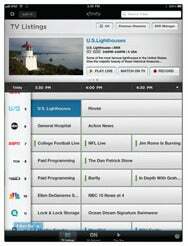 AnyPlay is a device that works through the Xfinity TV app on the iPad. The app already allows for on-demand video, but the new AnyPlay allows you to “watch the channels that are included in your linear channel subscription,” according to a Comcast Voices blog entry written by Mark Hess, senior vice president of video product development at Comcast. To use AnyPlay, you must have Comcast’s Xfinity Triple Play service and be enrolled in the Xfinity Insider program. Comcast says you may also have to pay $10 for an AnyPlay self-installation kit, which includes the AnyPlay device that plugs into an Ethernet port of your wireless router. According to the Comcast blog post, the AnyPlay device uses your home router to deliver a secure video signal to your iPad. Comcast says you can watch most of the channels included in the Xfinity TV service, but not channels that launch On Demand. Only one tablet can be used at a time with AnyPlay, though you can register up to ten tablets. (AnyPlay will also work with the Android-based Motorola Xoom tablet.) Also, the Parental Controls you’ve defined on your Comcast set top box do not restrict content on AnyPlay; you’ll have to set Parental Controls on the iPad, and it’s an all-on or all-off setting—you can’t lock individual channels, ratings or programs. For now, AnyPlay is available only to customers in Denver and Nashville. So I unfortunately have to continue to resort to recording a game, dodging all news feeds to avoid game coverage, and then watching the recorded game late at night. Comcast says that more areas will be added in the coming months.